Lack of legal framework, difficulty with regulatory control, lack of institutionalised ‘Trust’, and corruption and fraud stop cryptocurrencies from development, believes Stephen Pitt-Walker, founder & advocate at GHRA. Stephen Pitt-Walker is the management and strategic advising expert. He will be a participant of the panel discussion “Legal and Regulatory Challenges in Blockchain. Latest trends throughout Blockchain 2018-2019” at the Blockchain & Bitcoin Conference Australia, talking about regulations Blockchain faces and may face in the future. 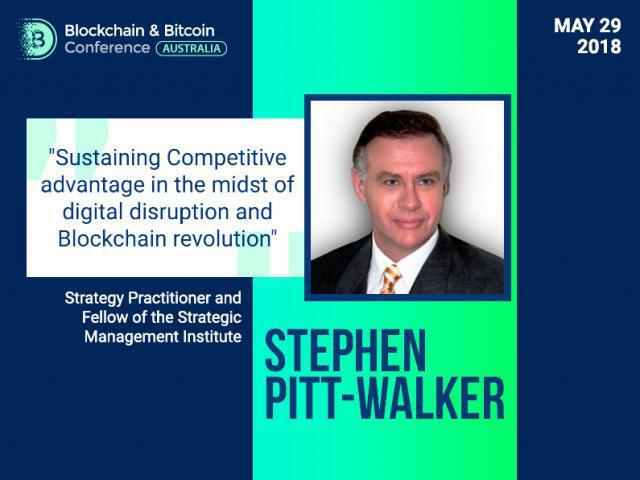 In the interview, Stephen Pitt-Walker discussed cryptocurrency and fiat money, regulatory laws and development of digital coins. BCA: Can cryptocurrencies provide serious competition to fiat money and consequently replace it? Why? SPW: There is considerable concern of late regarding the fiat money system, especially since wars and other Global crises have seen government debt rise to unprecedented levels without any ‘real’ collateralised support for currencies. It would be unusual in a world where capitalism produces strange and sometimes absurd outcomes, if cryptocurrencies (a form of digital money) did not create great interest. The problem is, in short, that they are not government backed (guaranteed) and difficult to regulate as financial instruments on open, decentralised digital markets. This means that in an already volatile financial currency market the risks and potential rewards are very high. There is no definitive answer to the question posed – and only time will tell. There are certainly risks and benefits to both systems, and in a world where currency wars rage as we speak the winners and losers are difficult to see without a crystal ball. What is certain is that cryptocurrencies (infant and developing) are here and will not go away easily, but it is also hard to see the ‘Fiat’ money system’s complete demise in the near to medium term. Gaining systemic trust is a key to whether cryptocurrencies such as Bitcoin will survive, thrive or become predominant. This is especially the case in a global financial system that operates still – and arguably more so today than was expected at the end of the last century – in a more isolationist, or at least nation-statist political-economic world. BCA: Which country’s approach to the regulation of digital assets and ICO do you like most of all? Why? SPW: Not that I am a complete pessimist, and not that Tulipmania is a living memory, but I think caution is a very sound approach to Bitcoin and other cryptocurrencies that are certainly belle d’jour but have not yet proven themselves to be robust enough to weather the storms of government intervention and market perception and the trust continuum. Last year China and South Korea banned ICOs and Japan’s changing opinions on the acceptability of ‘altcoins’ led to many nations taking an aggressive position in warning and protecting prospective investors and probably reasonably so. Individual protection by regulation is paramount to any investment and investment system, else we risk market crashes with systemic overtones such as the GFC, low capital adequacy ratios pre-Basel II, or the tech Boom-Bust 2000, or Japanese property market bubbles bursting 1990 and all the consequences thereof. Despite the best intentions of non-government, industry self-regulatory regimes, attempting to set standards for legal, tax, accounting and business due diligence (inter alia) the excesses of capitalism loom large for governments, global financial markets and investors. In order that fraud is limited and corollary financial harm restricted many countries are attempting to balance the risks and embrace the future of the cryptocurrencies. Perhaps the best way forward is not to ban the ICO altogether but to take a stricter stance on the regulations governing ICOs, while also enabling the platforms to develop under a ‘good governance’ and legal/regulatory regime. The cases in point would be the EU and Canada where the securities administrators have developed a “regulatory sandbox” to rule on ICO’s and altcoins under securities law and regulation on a case by case basis. BCA: How else can governments make use of cryptocurrencies apart from taxing? SPW: It is very difficult for governments to manipulate cryptocurrencies as it does fiat money by managing the value of funds through supply and interest rates. So, apart from taxing the transactions on exchanges and/or creating regulatory controls it is difficult to see how governments can use cryptocurrencies yet. This does not mean they will not find new ways to use altcoin to their and their population’s advantage it has simply yet to be defined clearly and to suggest ways would be to speculate. The question is whether governments will invest in controls or ban – illegalise – cryptocurrencies altogether. If governments (or banks and IT firms) can discover, or imagineer, ways to incentivize users to secure and formalize digital relationships they would harness the value of the internet and Blockchain. Government’s may then own, operate or, perhaps, more sensibly simply regulate the use of such a technology-based transaction layer within the decentralised, open architecture within which it subsists. BCA: Why does it take so much time to draft laws related to digital assets? SPW: As we know, drafting new legislation over relatively new social-economic edifices is a slow process. This is because governments, parliament and executive, must strive to understand the implications and consequences of the legislation that it drafts. This has both policy and legal consequence, and in all systems, whether Common Law or Civil Code, policy considerations and decisions as well as statutory enactment will have longstanding affect and potentially create precedent. Given the embryonic nature of altcoin and the commensurate limited understanding of their economic role and impact governments are left to manage their existence but are between a rock and a hard place. What and how do they legislate over such an unknown and infant financial instrument and market? It is likely that clear and wide-ranging statutory regulation will emerge over time. Evolution as opposed to revolution so to speak, depending on their strength and acceptance as an institutionalised currency. BCA: What hinders the development of cryptocurrencies today, in your opinion? Perception, lack of institutionalised ‘Trust’. Corruption and fraud – potential and real. See the expert and look into the blockchain’s regulatory future at the conference!